The Piddle Valley Players is a very friendly group and always welcomes new members. We rehearse on Thursday evenings from 7pm and some Sunday afternoons, from September to February at Piddletrenthide Memorial Hall. 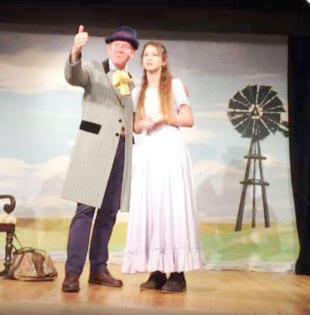 Some of their productions, including their recent “Guys and Dolls” and “Oklahoma”, are held in Buckland Newton Village Hall. 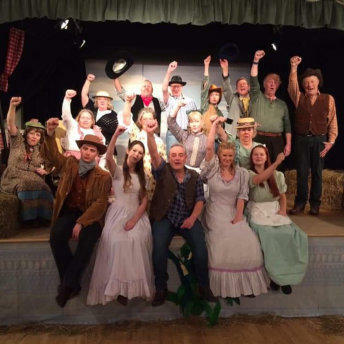 The Piddle Valley Players would like to thank all those who came and supported our recent five night run of Oklahoma in the village hall. The show was an outstanding success and showed that a West End musical can actually be put on in such a relatively small environment. The Piddle Valley Players are a group of villagers (many from Buckland Newton) and friends, who provide a unique show that is not attempted by any other such group. We are supported by Norman Adams on percussion, and two professional musicians, Louise Dukes on keyboard, and Richard Woodall on double bass. Combined with food and drink to match the theme of the show, it has always been an exceptional fun night out. The audience raised £508 from the raffle, and this went towards our chosen charities, St Helena Hospice, and Marie Curie. For further information, please contact our Director, Holly Royle on 07775 436075 or hollyr@hotmail.com Broadway comes to Buckland Newton - Piddle Valley Players -Guys and Dolls For five nights the audiences were transported to a fifties New York, innovative scenery moved us seamlessly from Mission Hall to Night Club to Havana and back. The hall was set up as a night club with subtle lighting, chequered tablecloths, dice and red hearts on the tables. Local talent blossomed, as ever, under the expert direction of Rachel Olley. We knew Holly Royle could sing but boy can she act - her high pitched, squeaky New York accent as Adelaide was brilliant and of course her singing was excellent. Her backing troupe of Annie Lock, Alice Goddard, Emily Knights and Nicky Edmunds was step and pitch perfect. John Aspinall as Sky Masterson was a revelation - he took on the part and made it his own (who needs Marlon Brando) and Hattie Olley as the subject of his attention was superb. Her singing and acting were so good and she looked to be having a great time, especially in Havana! Pete Lindsley took on the Frank Sinatra main role and, as we have come to expect, delivered a high quality performance. From the drama of Luck Be A Lady (John Aspinall and the gamblers on fine form) to the poignancy of More I Cannot Wish You (Suzie Thorpe charming the audience) the Piddle Valley Players did themselves proud. The costumes were many and spot on - from the guys in their suits and hats, the Cuban dancers, the nightclub entertainers to the mission outfits. With a great live band on the stage the action took place in the centre of the hall so everyone had a good view. During the interval cast members served excellent rum and lime daiquiris along with authentic New York bagels with the traditional cream cheese and smoked salmon - delicious. 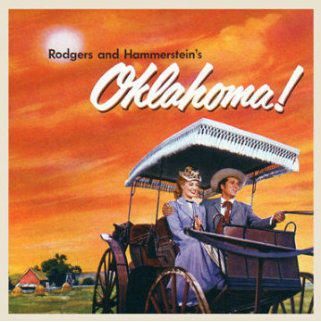 February 2019 - in Buckland Newton Village Hall - Rodgers and Hammerstein’s ‘Oklahoma’ was another great success for the talented Piddle Valley Players. Raffles at the show raised £254 each for St Helena Hospice and Marie Curie.